Mayan ruins or outdoor adventures? Taste of the Caribbean or Mexican immersion? Florida or California departures? These are some of the questions wannabe Mexico cruisers need to ask themselves when choosing an itinerary. That’s because Mexico cruises come in two flavors: east coast cruises that are part of larger Caribbean itineraries and west coast cruises devoted entirely to our southern neighbor. If you want to visit Mexico via cruise ship, you’ll need to decide what interests you most in order to pick the itinerary that’s best for you. The biggest difference among Mexico itineraries is that Baja Mexico and Mexican Riviera cruises call only at Mexican ports, whereas western Caribbean cruises usually combine stops at one or two Mexico ports with calls at a few Caribbean islands. Cruisers who want to immerse themselves in Mexican culture should stick to the west coast itineraries. Travelers who want a taste of several countries, including Mexico, should book a western Caribbean itinerary that calls at Cozumel or Costa Maya. Another deciding factor is onshore activities. The famous Mayan ruins—including Chichen Itza, Tulum, Chacchoben, and Kohunlich—are only accessible from Mexico’s eastern ports. 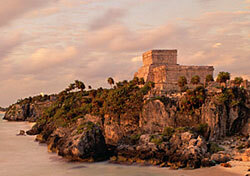 Visitors who want to experience Mexico’s ancient history should therefore choose a Caribbean cruise. Mexico’s west coast has more to offer in the way of nature-based activities, marine wildlife, recent history, and shopping. Guests can watch cliff divers in Acapulco, take an eco-safari from Puerto Vallarta, tour the Sierra Madre from Mazatlan, or go sport fishing in Cabo San Lucas. Beach lovers will be happy with either itinerary. Not surprisingly, many people consider departure location when choosing a Mexico itinerary. Most Baja Mexico and Mayan Riviera cruises depart from the California ports of Los Angeles, San Diego, and San Francisco. Western Caribbean cruises depart from a variety of ports on the U.S. East Coast, including ports in Alabama, Florida, Louisiana, New York, South Carolina, and Texas. A Georgia resident is likely to keep cost downs by sailing out of a Florida port to the western Caribbean, while an Oregon native will find it more convenient to cruise from California to Mexico’s west coast. Driving rather than flying to a departure port is always a great way to save money. Once you’ve figured out East versus West, it’s time to think about travel dates and costs. You can sail the western Caribbean year-round, but many lines only offer west coast Mexico cruises from September through April or May. Although Baja Mexico and the Mayan Riviera have suitable weather for cruising throughout the year, many of the California-based ships that visit these destinations reposition for Alaska cruises in the summer. If you’re looking for a deal, you’re more likely to find one in late November, early December, and early January. The western Caribbean experiences hurricane season in the late summer and early fall, so these dates are often discounted as well. The December holidays and school vacation weeks in February, March, and the summer are peak travel periods, so prices can rise for cruises at those times. However, the Caribbean has been soft this year, so low rates may be available for late-winter cruises and summer sailings. Still, the cruise lines encourage guests to book at least six months in advance. No matter which coast you pick, Mexico makes for an ideal cruise destination with beautiful beaches, cultural and outdoorsy activities, and plentiful deals. If you can’t decide, perhaps consider booking two cruises so you can experience what both sides of Mexico have to offer.